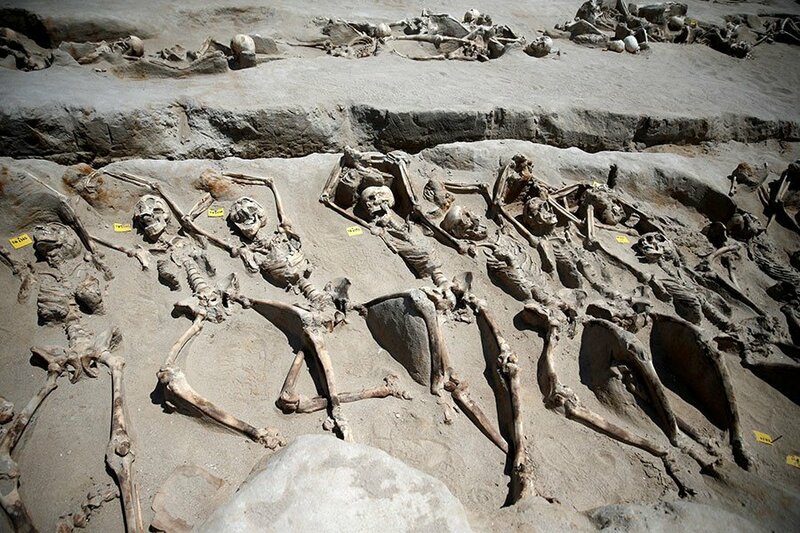 Alcmaeonid curse: These skeletons of men who were killed with their hands tied may be some of Cylon’s supporters. The Alcmaeonids (alk-MEE-oh-nids) were a very rich family who lived in Athens in the Archaic and Classical periods. “Alcmaeonids” means the descendants of Alcmaeon. The Athenians thought that all the Alcmaeonids were under a curse. The first time we hear about the Alcmaeonids, they’re fighting against a man called Cylon (SI-lonn) who wanted to become tyrant of Athens, in 631 BC. There was a big fight between Cylon and the other rich men of Athens. Finally Cylon gave up and surrendered. Cylon came out under truce, giving up, but the Alcmaeonids stabbed him to death anyway. Because they had killed someone under truce, the Athenians thought the Alcmaeonids and all their descendants were cursed. They were all banished from Athens. Alcmaeonid curse: Pericles died of the plague. The curse didn’t keep the Alcmaeonids from continuing to be a powerful and very wealthy family. In 548 BC, when a terrible earthquake knocked down the temple of Apollo at Delphi, the Alcmaeonids paid to have it rebuilt, bigger and better than ever. This got the oracle at Delphi on their side. Alcmaeonid curse: Alcibiades (from a later portrait done after he was dead) lost the Peloponnesian War. When Pisistratus’ son Hippias was tyrant of Athens, he was so unpopular that one of the Alcmaeonids, Cleisthenes, saw a chance to get back into power in Athens. The Delphic oracle encouraged the Spartans to help the Alcmaeonids throw Hippias out in 510 BC. Cleisthenes went on to start the Athenian democracy. 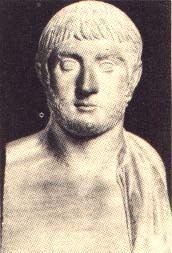 Pericles was another famous Alcmaeonid (on his mother’s side). He was a general who commanded the Athenian army in the first years of the Peloponnesian War, before dying of the plague. The last famous Alcmaeonid was Alcibiades (he was an Alcmaeonid on his mother’s side; Pericles was his uncle), who betrayed Athens and helped make Athens lose the Peloponnesian War in 404 BC. The Age of Pericles, by Don Nardo (1996). (The baby-preschool label on Amazon is wrong). Cleisthenes: Founder of Athenian Democracy, by Sarah Parton (2002). A biography of the founder of Athenian democracy. Pericles Of Athens And The Birth Of Democracy, by Donald Kagan (1998). Kagan is a well-known expert on classical Greece, though his views are a little more accepting of Greek racism and military aggression than I would like. Alcibiades, by Walter M. Ellis (1989). Unfortunately this book is out of print, so you should try a library. But you never know. Maybe Routledge will reprint it. Tides of War: A Novel of Alcibiades and the Peloponnesian War, by Steven Pressfield (2000). Not as good as Pressman’s novel about Thermopylae, Gates of Hell, but still an entertaining way to find out more about Alcibiades. For older readers – a lot of violence, and some romance. Cite this page: Carr, K.E. The Curse of the Alcmaeonids. Quatr.us Study Guides, July 7, 2017. Web. April 20, 2019.